January has been a very busy month and as it turns out, a very cold month too! Our students have done another round of MAP testing, Catholic Schools Week was shortened (but still fun), registration for next year has opened and our teachers are working hard to ensure students meet their grade level goals before May. The second half of the school year always flies by. Before you know it, we will be enjoying Raider Day! Thank you to Ellie Menke for all her technology and marketing expertise. Ellie has helped us design new family brochures, manages our Facebook, Twitter, and Instagram pages and continues to update our school webpage. We are grateful for her dedication to MHR. Thank you to our teachers for the countless hours of planning completed outside the school day. Teaching is NOT an easy job and these teachers handle it with grace. Thank you to Father Paul for serving our country. We are so grateful for your safe return to MHR! Thank you to School Advisory Board (SAB) and Parent’s Club for assisting in our Catholic Schools Week activities. Thank you to all of you who joined us for Catholic Schools Week Mass and Open House. We very much enjoyed spending our Sunday with all of you. Ellie Menke and Jen Busk are organizing a new Alumni database. If you are a proud MHR alum or know one, please have them fill out this form to join our database. We have entered the flu and cold season. Please be sure to keep you children home for a full 24 hours if they have shown any symptoms of being ill. Washing hands, regular sleep patterns, and eating well are great tools to help keep your child’s immune system in top condition. We are very excited but also sad, to announce the retirement of Mrs. Gina Pakalka. This year marks Gina’s 44th year at Most Holy Redeemer. We will continue to celebrate Mrs. P throughout this year. We welcome to our office Mrs. Terese Enright! Terese will be working Thursday and Friday. We are so lucky to have her on board! We have a new part-time first grade aide, Ms. Becca Prezclike. Becca comes to us from the St. John Fisher neighborhood. We are so happy she could join our staff. Ms. Michon is back! Ms. Michon has jumped right back into the saddle. She is working with individual students and small groups. Additionally, she team teaches with our Kindergarten and 1st grade teachers, assists with the Second Step, Social/Emotional Curriculum and so much more. The three days she is here are always very busy. Welcome back, Ms. Michon! We missed you! January 27 kicked off the start of CSW! Open house was a success with several new families touring the school and asking questions. Continue to spread the word, that Most Holy Redeemer is alive and well. Preschool classes fill quickly, so don’t hesitate! For information on new student registration, please click here. As you may already know, last year we asked our rising 6th grade to purchase a Chromebook (through MHR). Our teachers have been rethinking instruction and making way for technology to become an integrated part of their curriculum. Since it is going so well, we decided to extend the initiative and next year we are asking our rising 5th and 6th grade families to purchase Chromebooks. Following the 2020-2021 school year, all students in grades 5-8 will own their own Chromebooks. We will continue to equip our younger students with iPads for each classroom and eventually a few sets of Chromebooks to share. A new technology plan is in the works, and I hope to share the details with you soon. Last year we partnered with Northwest Evaluation Association/Measure of Academic Progress, NWEA/MAP. We have been learning how to assess our students using a computer based assessment program that makes gradual adaptations based on how well a student answered previous questions. Meanwhile, we are also testing out a new but similar product, IReady. The Office of Catholic Schools has asked us to pilot this assessment tool for our Kindergarten, 1st and 2nd grade students. Did your student bring home a cute picture or art project that you have been sharing with grandparents? Send us a picture! Are your kids doing dance or piano recitals? Send us a picture! Did the kids go out to play in the snow? Send us a picture! We are looking to share pictures that show our students doing activities outside the school day and share accomplishments-even if they are just pretty pictures. Please be sure to share things with us. You can email them to publications@mhrschool.com. As I finish this letter from home today, it seems that our Learning From Home Day 1 has been a success. We know that some of our students had difficulty with internet and so did our teachers. However, we planned for that possibility and students had alternative plans, just in case. Most of students were asked to do paper tasks with little to no need for technology. I am proud of our teachers for making learning meaningful. They were charged with the task of designing activities that would move learning forward. We did not want the day to be filled with typical homework assignments, but instead independent work that may have been completed if students were in session. Our teachers were expected to be accessible, via email, during the regular school day (8am-3pm). Let’s not forget, teachers can not be replaced and the value of attending class with peers has many benefits. As we continue to explore Learning From Home Days, I hope you will send us your feedback, concerns and praises. Thank you to our parents who shared pictures from their home classrooms! We loved seeing our students actively engaged in their work! Continue to share your photos with us by emailing them to publications@mhrschool.com. This week, our teachers received more professional development to continue to become better acquainted with ThinkCERCA (6-8th) and Keys to Literacy (PreK -3). Teachers are practicing new instructional strategies focused on Writing. The Next Generation Science Standards, NGSS, came out several years ago. However, our Science resources (or lack of resources) were not aligned with the new standards. Teachers have been doing their best to introduce and practice the standards, but it has been a challenge. We are pleased to announce that we have purchased FOSS Science Kits. Each kit is an entire unit of study. For example, 2nd grade has a unit on Solids and Liquids, 3rd grade will use a unit titled, Weather and Climate, and one of the Middle School kits is a unit on Chemical Reactions. FOSS is committed to the notion of kids learn Science by doing Science! Students will be given the opportunity to experience engaging activities that will lead to a deeper understanding of the natural world. We hope to have them in our school before the end of next week. Teachers will need time to become familiar with the kits before using them with the students. We hosted an Early Childhood Open house on January 17. This was an exciting evening in our classrooms filled with welcomes, Q & A, and lots of information. If anyone missed this event and would like information on our Early Childhood programs, please contact us. Plenty of new faces joined us at the Evergreen Park Library Preschool Enrichment Fair on Saturday, January 26. 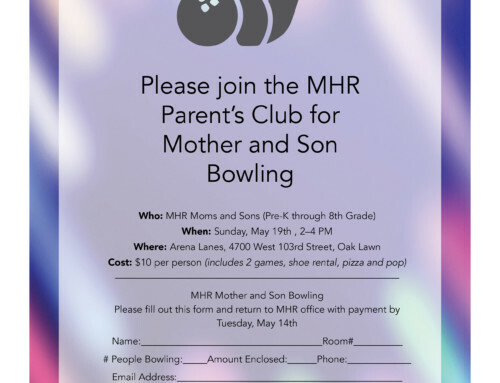 This was a great opportunity for parents to learn all that MHR has to offer. We were so honored to be a part of this event! 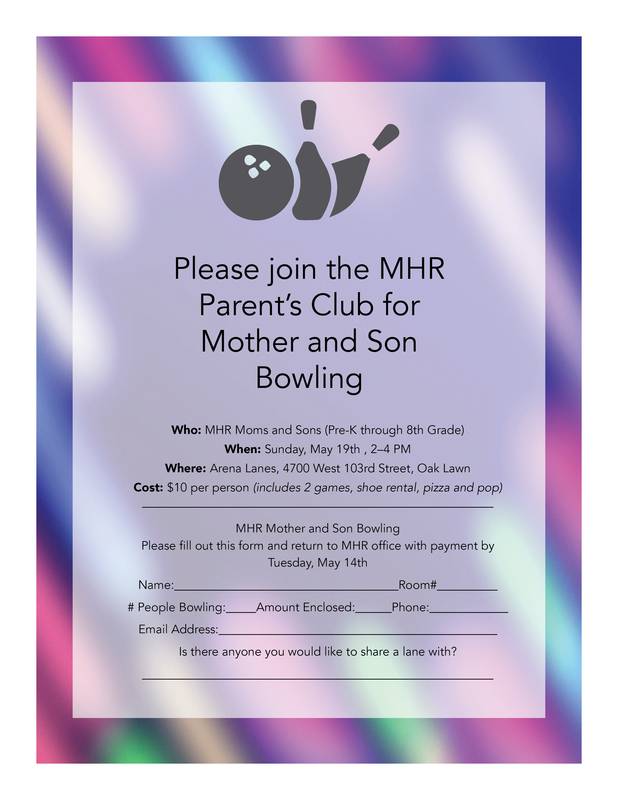 Please remind the young parents in your lives about the great education that MHR provides. We hope that they’ll keep us in mind when it comes time to begin registering their children for school. The 4th graders of our parish are hosting Family Mass on February 10. Please plan on joining us as we worship together. We are currently collecting for the Ronald McDonald House. Be sure to check with your Google Classroom for more details. Our 8th graders will receive the holy sacrament of Confirmation on February 24. Please keep them in your prayers as they prepare for this special day. Planning for our Parish Lenten Event, Mercy in the Village (March 28, 29, and 30) is underway. Look for more details to come. Father Daughter Dance: Tomorrow Night. Thank you to anyone who is volunteering their time or bringing a treat! We look forward to hearing about all the dancing on Monday morning. Wee Raiders: Check our calendar and plan on joining us every other Friday. These sessions are a can’t miss! Spread the word to parents of toddlers and young children and have them join us one Friday. February Raider Raffle Drawing: get your tickets in by Wednesday, February 13. The drawing is scheduled for Friday, February 15. Catch the video on Facebook that day! School will not be in session on Monday, February 18. School WILL be in session on Friday, February 8th to make up for our Snow Day in November. Congratulations to Mrs. Bridget Fanelli. Bridget is a Raider mom and teacher. She has been a Most Holy Redeemer Preschool aide and now a Preschool teacher. Mrs Fanelli’s tender care and lighthearted inclinations brings a great energy to her classroom. Mrs. Fanelli’s can-do spirit and cheery demeanor makes her an asset to our school. She is always willing to help when called upon with a positive attitude and smile on her face. I am grateful to have Mrs. Fanelli on our staff. Congratulations to Ms. Megan Mattia! This year, she was excited to lead a 6th grade homeroom and try new teaching strategies with her ELA teaching partner, Mrs. Condon. Ms. Mattia has a knack for capturing the obvious and using it to resolve problems. We are grateful for her role as Master Scheduler. There is nothing more complex than puzzling out the school’s master schedule. Ms. Mattia has the ability to see it and ensemble it with ease. Ms. Mattia’s students are lucky to be able to enjoy her fun-loving spirit and her ability to easily integrate technology into her lessons. Thank you, Ms. Mattia for your continued service to MHR! Congratulations to Ms. Lauren Provenzano. Ms. Provenzano has only been at MHR for a short time, but we are all happy she is here! Ms. Provenzano has a wonderful rapport with her students and obviously enjoys teaching. Ms. Provenzano is a reflective teacher who is always looking for ways to make her lessons more effective and her room more responsive to student needs. We were very fortunate to have Ms. Provenzano join our staff this year. We look forward to her long career with us.